The Karuna Foundation is planning to invite ten children from the Fukushima nuclear disaster zone in Japan. The children will be staying at the Karuna Centre Katoomba for a nine-day respite in August 2013. We are looking for volunteers in order to make the children's visit to Australia enjoyable. Volunteers are the key to its success. 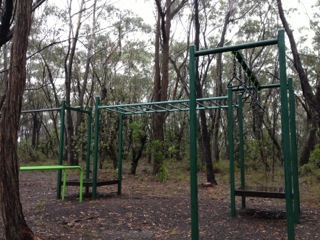 The existing outdoor play ground needs much attention since the area has to be totally safe with a flat surface. 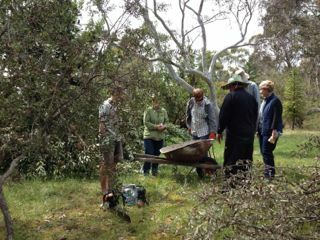 A simple job such as picking up fallen sticks and branches from the area will be much appreciated. 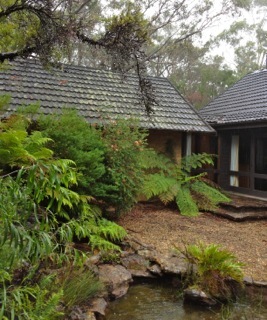 Apart from these areas, the Karuna Centre Katoomba requires ongoing fire hazard reduction work and general maintenance work such as cleaning windows and weeding. If you are interested in giving some volunteer work to help with improving the venue, please contact us. Your support will contribute to welcome the Fukushima children to a clean and safe environment. I understand that we are all busy people and our weekends are very precious. However, the beautiful environment of the Karuna Centre and the company of lovely people will be sure to give you an enjoyable experience. Please bring your family and friends, a picnic lunch and working gloves. 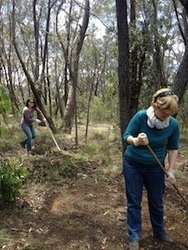 Free accommodation is available for volunteer workers. For more information, please contact us. There were 12 enthusiastic and helpful volunteers who came to the Karuna Centre on the weekend of 26 and 27 January. We made good progress on clearing undergrowth for fire prevention, cleaning windows and screens around the dorm and main hall area, weeding the Japanese garden courtyard area, window and web clearing in the Carriages, and gardening around the dining hall. 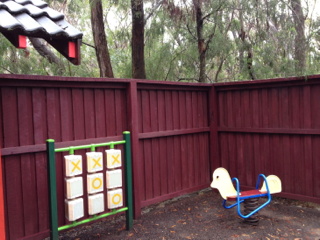 Sophal, has also been busy, having done an amazing job of painting the childrens' playground equipment, the surrounding fences and entrance gate, creating a new table tennis games room, and lots of ongoing maintenance work. A new solar energy system has now been installed, making the centre even more environmentally friendly. The transformations continue as we prepare for the Fukushima children arriving on 29th July. 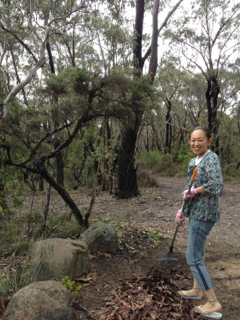 There's plenty still to be done, and volunteering at Karuna is fun!Working together, with lots of interesting chatter and laughter as we go; in the beautiful fresh air and incredible natural bush environment. The next volunteer weekend will be 23-24 February 2013. Contact Nara by emailing narap.lotus@gmail.com if you would like to come along. If you love cooking Japanese food/healthy food or simply willing to help, you are very welcome to join us as a part of our support team. The children from Fukushima will be from 10 to 12 years of age. They will have very little or no English ability. Although we will have five carers who can speak English, it is vital for us to have Japanese speaking people to assist the children with day-to-day living in the Karuna Centre. If you know anyone who can speak Japanese and who might be interested in helping these children, please contact us. We need more backup funds to pay for children and their carers from Japan for their 2 weeks stay in Australia. If you are an experienced fundraiser, please come to discuss with us about your ideas and plans to bring dollars in. Would you like to help the Karuna Fukushima Project?